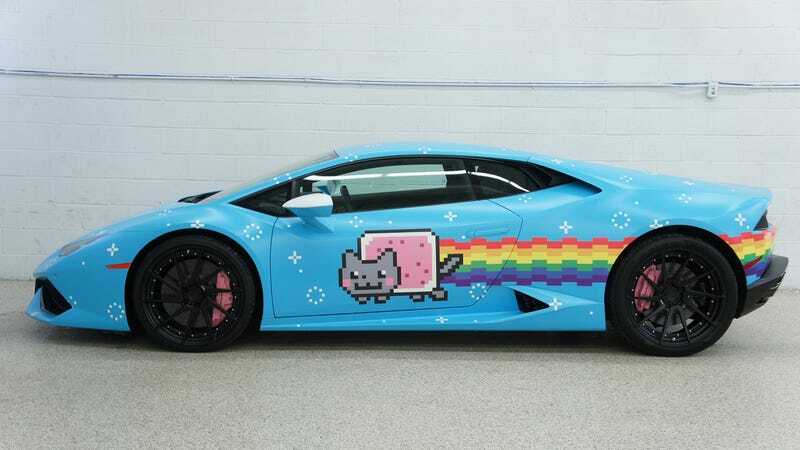 Deadmau5's Nyanborghini Purracan Is For Sale You Guys!!! Canadian record producer, DJ and Ferrari-troller Deadmau5 (pronounced “dead mouse” and not “dead-mao-five”) keeps up a pretty eclectic car collection. And by eclectic I don’t mean the cars are weird and funky. I mean he customizes them all weird and funky and that’s what makes them wonderful. One of them, a 2015 Lamborghini Huracán, dubbed the ‘Nyanborghini Purracan’ is for sale. This is the only modern Lamborghini I would ever consider buying if I had the money. This sounds awfully apologetic to me. As though a boring somebody would see that work of art sitting there and say, “Yeah, all of that needs to go.” I’ll tell you what’s boring: a stock Lamborghini Huracán. Thankfully, the rest of the cars that Deadmau5 owns or has owned (which include a McLaren P1, BAC Mono and a Ferrari “Purrari” 458 Italia) are stylistically unconventional. Somebody buy this car. And then maybe drive for Uber or something.